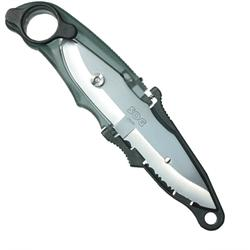 Just when you thought a knife was just a knife, SOG has created one that is more… much more. The new SOG Duo almost defies description. Is it a fixed blade or a folding knife? You decide. the Duo solves this debate by offering both versions for enhanced performance capabilities. Any flat-head screwdriver or pocket coin will unscrew the bolt holding the second blade and allow it to be turned. Of course there is a removable clip and lanyard holes to provide a variety of mounting options. The Duo is perfect for any outdoor scenario including water sports, backpacking, boating, climbing, or just to put in your tacklebox or toolbox for those unexpected adventures! The Duo: because two blades are better than one!